Pyle & Kenfig Links is the ultimate in golf day venues, offering the eager player 18 challenging but picturesque holes of golf, great food and the attention to detail that turns a good event into a great one. The amount of clients that return year after year is testament to the P&K Experience each and every group receives. On arrival you will be greeted by a warm coffee or tea and our Professional Staff and Course Marshal, who will welcome your group to the course and organise any Nearest the Pin and Longest Drive competitions that you may require. The Professional shop staff will confirm the details of your day. Although handicap certificates are not compulsory the Marshal will expect your last group to complete their round in four hours fifteen minutes. 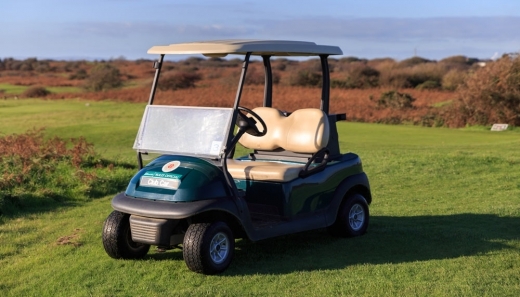 Buggies and Electric hire trolleys are available throughout the year (weather permitting). Our Professional Dylan Williams and his team stock a wide range of golf equipment and prizes for your golf day - everything from Logo Golf Balls to Club shirts and prizes. As a starting point, you can choose from our packages below, and we can always taylor make any specific packages you require. Meals can be taken before or after golf in our private dining room where you can relax as a group. We offer various corporate day packages for golfers, and an alternative for any non-golfing guests you may wish to invite “Learn Golf in a day”, whereby they are given a day's structured tuition by our Professional staff and are able to play on our academy course. This suits many corporate groups, as clients can then try the game and still join in with the rest of your group for lunch and dinner. All of our Packages can be tailored to suit your group requirements. In order to make your day run smoothly, we have outlined 2 different packages for you to choose from, (min 12 Golfers) weekdays only.